ultimate harry potter halloween party Archives - Hello, Kristina! The largest shop at our Halloween party was Borgin & Burkes, naturally, as it’s the only Knockturn Alley shop we really know anything about. For some reason our house has a built-in bar, so we designed this shop around it. Technically it was assigned to my roommate Justin, but it was more a collaboration between all of us. The idea was to have food in the front, and a museum of artifacts “for sale” in the back. Each of the dark artifacts had a tag on it with the name and a price. Some were things we happened to have sitting around the house already (like the books and creepy picture frame and hourglass) while others we either purchased specifically for the event (ie. George’s ear) or entirely made from scratch. 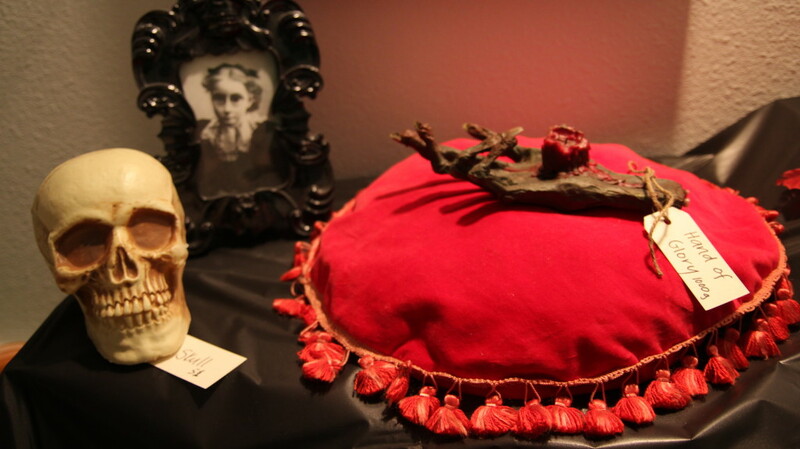 This hand of glory was made by my roommate Liz. She worked on it for days, creating the entire thing out of popsicle sticks, hot glue, paper mache, acrylic paint and wax. You can read her hilarious and disturbing tutorial here. 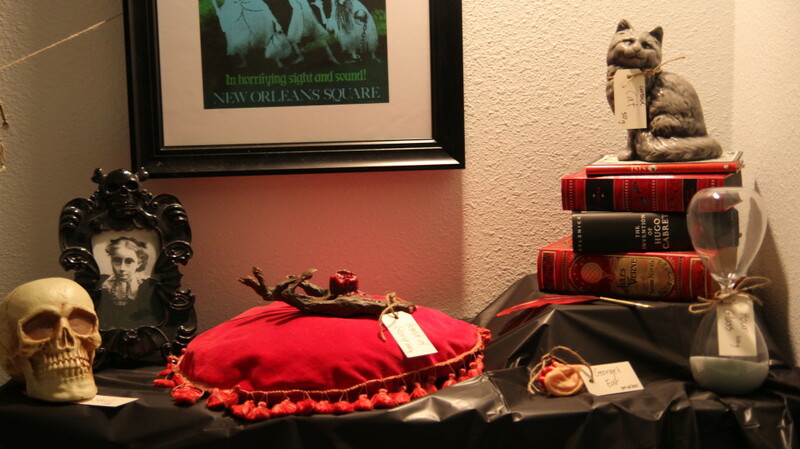 The red display pillow we happened to find at a consignment store on the same day as the party, which was exactly the sort of luck we kept running into throughout most of the party-planning process. 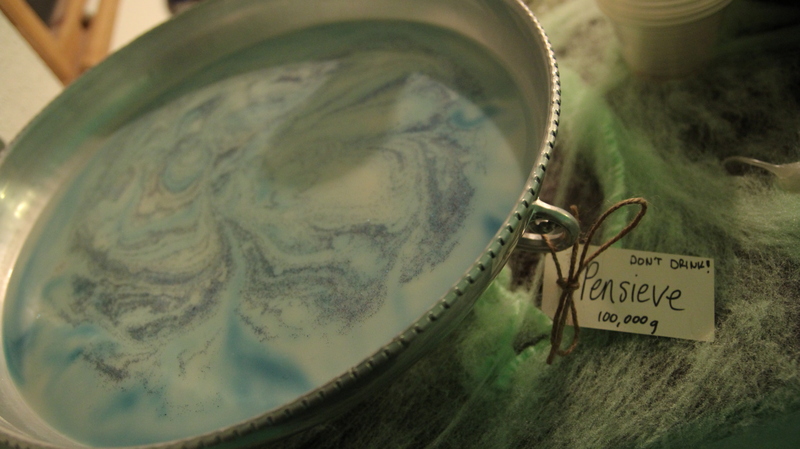 Eia created this pensieve. The concoction inside is a mixture of almond milk, blue food coloring that we took care not to mix too thoroughly, and fine glitter. If you create a pensieve for your own party, please make sure your guests don’t confuse it with another punch bowl! 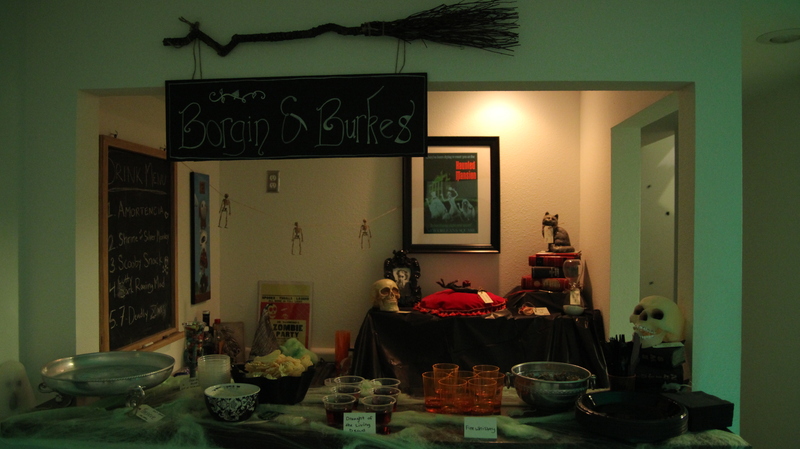 Next up were the food and drinks for Borgin & Burkes. We went pretty dark with everything at this station, which was surprisingly fun for creating snacks. 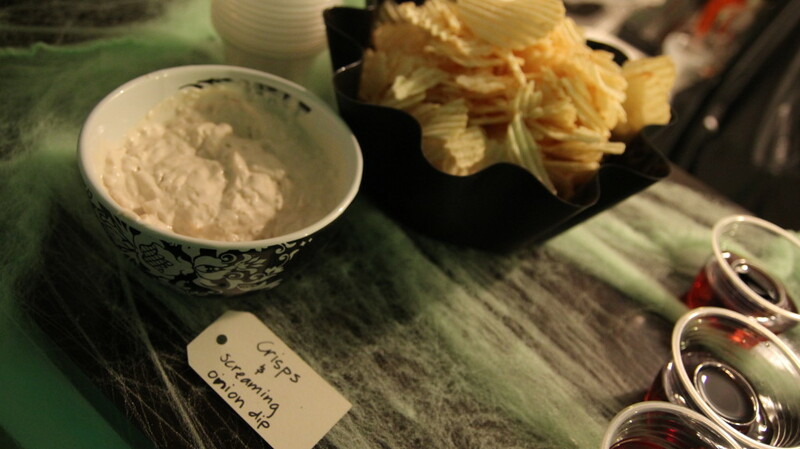 Every party needs chips and dip, so that was an easy one. 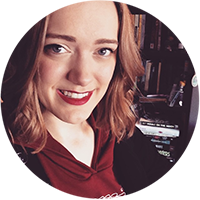 The firewhiskey was just Fireball whiskey (no use making it more complicated than it needed to be), while the Draught of Living Death was a bit more on the fancy side. 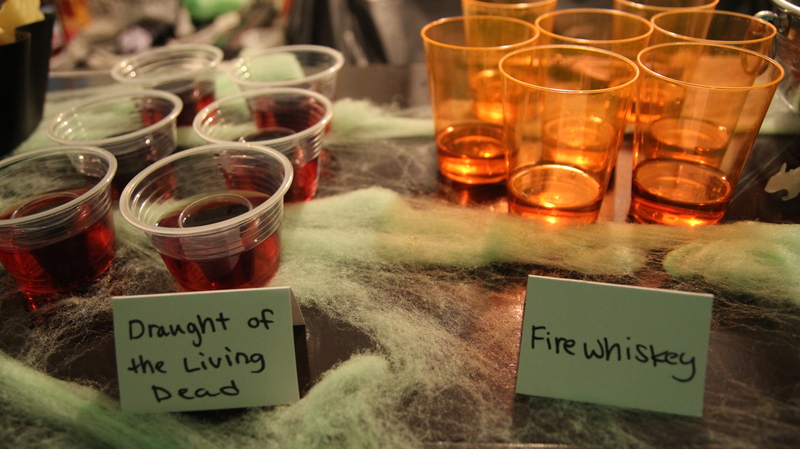 We used drop shot cups with cranberry juice on the outside, and black Blavod vodka on the inside. It’s pure black! 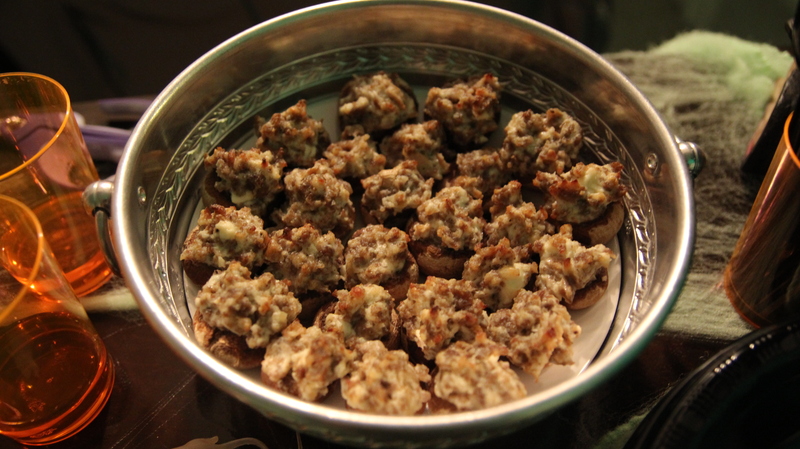 It absolutely had that creepy, foreboding look – but was quite popular with the guests. I really loved that our party guests all took the time to walk through and take in the detail we put into each shop, and Borgin & Burkes was definitely the most exciting one for crafts and artifacts. I love the scene in Chamber of Secrets when Harry mistakenly ends up here and wanders through some of the creepier things on display, so we wanted to try and recreate that feeling. Let me know your thoughts in the comments, and stay tuned for the remaining two shops!